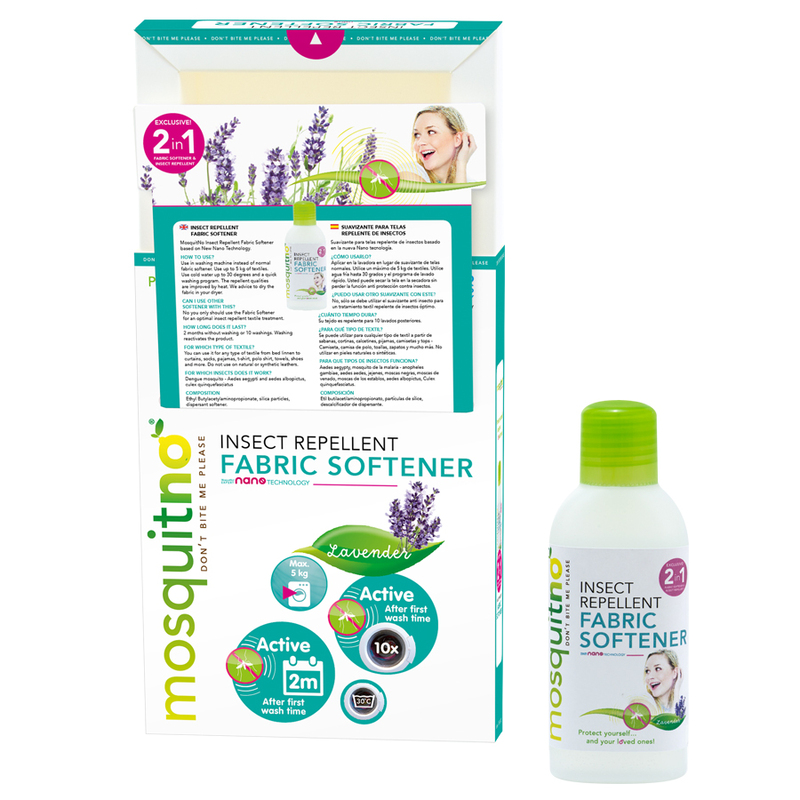 Just add the 60ml bottle MosquitNo Fabric Softener to your washing and your textile is repellent for 10 washings afterwards and 2 months without washing after first wash time! Wash the clothes you are bringing on vacation, or your bedsheets and curtains and you are protected against mosquitoes for the whole summer! 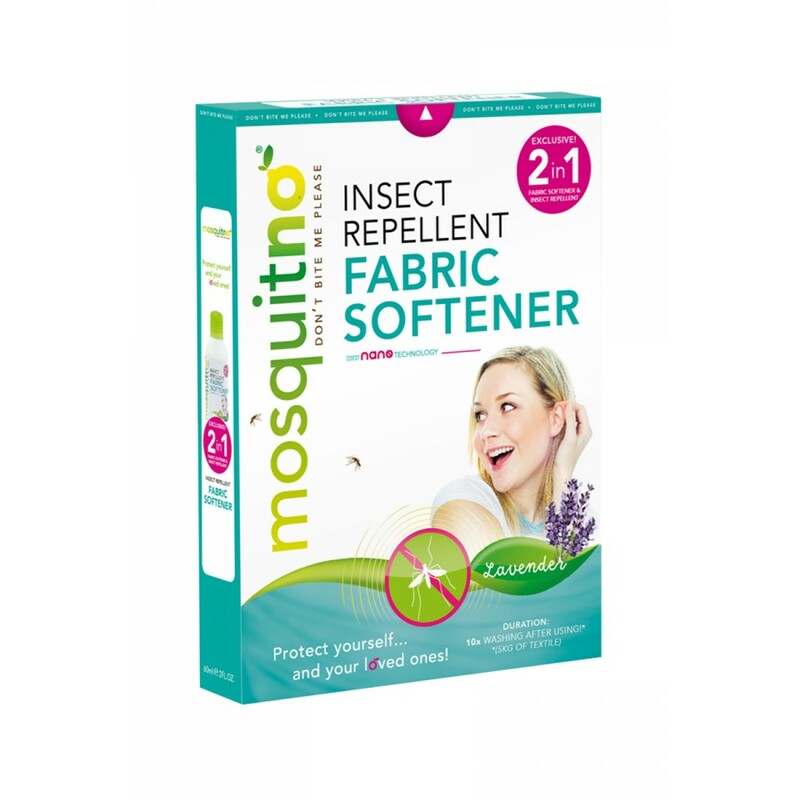 This innovative Fabric Softener protects you against all mosquitos and a lot of other dangerous insects! Like: Aedes aegypti, malaria mosquito - anopheles gambiae, aedes aedes, sand flies, black flies, deer flies, stable flies, aedes albopictus, culex quinquefasciatus. To be used at 30 ̊C max. HOW TO USE? Shake well before use. Apply in washing machine in place of normal fabric softener. Use up to 5 kg of textiles. Use in cold water up to 30 degrees an quick washing program. You can dry the fabric in your dryer without losing the anti insect protection function. CAN I USEOTHER SOFTENER WITH THIS? 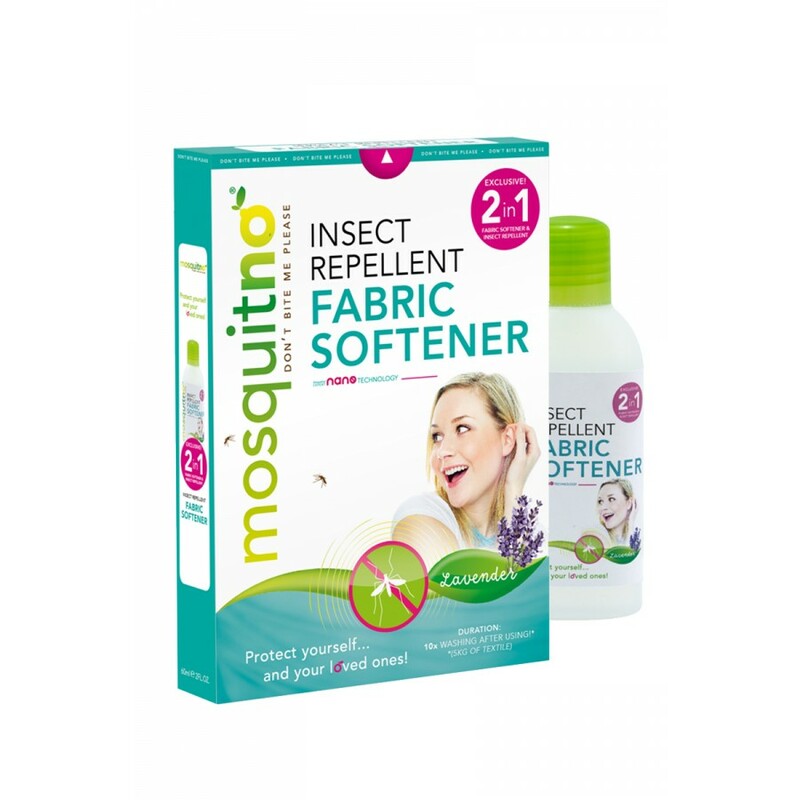 No you only should use the Fabric Softener for an optimal insect repellent textile treatment. HOW LONG DOES IT LAST? Your textile is repellent for 20 washings afterwards. FOR WHICH TYPE OF TEXTILE? You can use it for any type of textile from bed linnen, to curtains, socks, pajama, t-shirt, polo shirt, towels, shoes and more. Do not use on natural or synthetic leathers. FOR WHICH INSECTS DOES IT WORK? Aedes aegypti, malaria mosquito - anopheles gambiae, aedes aedes, sand flies, black flies, deer flies, stable flies, aedes albopictus, culex quinquefasciatus. USE: Use only as directed, shake before use. Keep out of reach of children. Do not eat, drink or smoke during application. For external use. Avoid contact with eyes. Do not expose to temperatures exceeding 50ºC. IF IN EYES: Rinse cautiously with water for several minutes. Remove contact lenses, if present and easy to do. Continue rinsing. INGREDIENTS: IR3535 Ethyl Butylacetylaminopropionate, silica particles, dispersant softener.